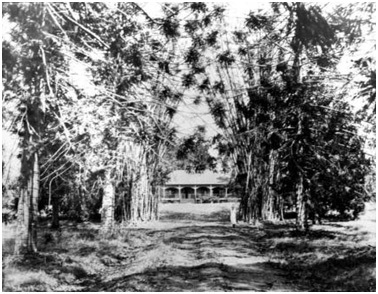 Construction of the first stage of the Murrumba homestead, which stood as a major landmark in the Petrie area for nearly 90 years, was completed by 1864 on Tom Petrie’s Portion 23 near its western boundary with Portion 29, replacing early temporary structures used by the family. Petrie was a foundation member of both the Caboolture and Redcliffe Divisional Boards and he continued to play a significant role in local affairs until his death at Murrumba on 26 August 1910. 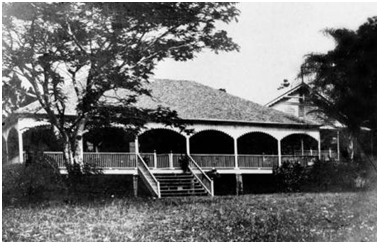 The homestead remained on the site for nearly ninety years and became an important centre for the local community. Sadly, however, the property was sold in 1951 and the homestead was demolished the following year. Our Lady of the Way School now occupies a significant part of the original Portion 23 land. An historic plaque in the grounds near the Armstrong Street car park commemorates the Murrumba homestead site. A second plaque, beside the approach to the car park, marks the approximate position of the stables and commemorates the association with Cobb & Co. coaches which used Petrie’s facilities as a changing station. A large number of the trees planted by Tom Petrie, which still survive in the grounds, have considerable historical significance.